Chalcis (; Ancient Greek & Katharevousa: Χαλκίς, Chalkís) or Chalkida (Modern Greek: Χαλκίδα, ) is the chief town of the island of Euboea in Greece, is situated on the Euripus Strait at its narrowest point. The name is preserved from antiquity and is derived from the Greek χαλκός (copper, bronze), though there is no trace of any mines in the area. In the late Middle Ages, it was known as Negropont (Italian: Negroponte, "black bridge"), a name that was applied to the entire island of Euboea as well. Its people are known in English as Chalcidians. The earliest recorded mention of Chalcis is in the Iliad (2.537), where it is mentioned in the same line as its rival Eretria. It is also documented that the ships set for the Trojan War gathered at Avlis, the south bank of the strait nearby the city. Chamber tombs at Trypa and Vromousa dated to the Mycenaean period were excavated by Papavasiliou in 1910. In the 8th and 7th centuries BC, colonists from Chalcis founded thirty townships on the peninsula of Chalcidice and several important cities in Magna Graecia, such as Naxos, Rhegion and Cumae. Its mineral produce, metal-work, purple and pottery not only found markets among these settlements, but were distributed over the Mediterranean in the ships of Corinth and Samos. With the help of these allies, Chalcis engaged the rival league of its neighbour Eretria in the so-called Lelantine War, by which it acquired the best agricultural district of Euboea and became the chief city of the island. Early in the 6th century BC, its prosperity was broken by a disastrous war with the Athenians, who expelled the ruling aristocracy and settled a cleruchy on the site. Chalcis subsequently became a member of both the Delian Leagues. Under Roman rule, Chalcis retained a measure of commercial prosperity. 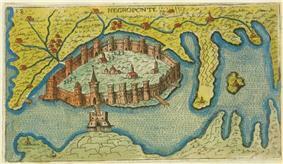 Venetian map of Chalcis (Negroponte) (1597). The city is recorded as a city in the 6th-century Synecdemus and mentioned by the contemporary historian Procopius of Caesarea, who recorded that a movable bridge linked the two shores of the strait. 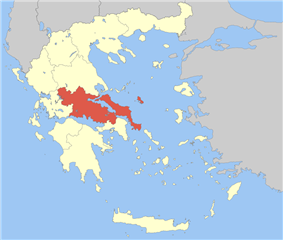 In Byzantine times, Chalkis was usually called Euripos, a name also applied to the entire island of Euboea, although the ancient name survived in administrative and ecclesiastical usage until the 9th century; alternatively, it is possible that the name was given anew to a settlement that was founded in the 9th century in the location of the ancient city after the latter had been abandoned in the early Middle Ages. 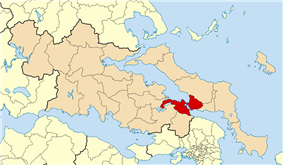 The town survived an Arab naval raid in the 870s and its bishop is attested in the council held at Constantinople in 869–70 that within the Roman Catholic Church is considered the eighth Ecumenical Council. By the 12th century, the town featured a Jewish community and a Venetian trading station, being attacked by the Venetian fleet in 1171 and eventually seized by Venice in 1209, in the aftermath of the Fourth Crusade. Known by the Westerners as Negroponte ("black bridge" in Italian, having arisen as a folk-etymological corruption of the medieval Greek name of Euripus Strait, Egripos), the town was a condominium between Venice and the Lombard (Veronese) barons of the rest of Euboea, known as the "triarchs", who resided there. Chalcis or Negroponte became a Latin Church diocese, the first bishop being Theodorus, the Greek bishop of the see, who entered communion with the see of Rome. In 1314, the Latin see was united with the Latin Patriarchate of Constantinople, so that the patriarch, excluded from Constantinople itself since the Byzantine reconquest of the city, could have actual jurisdiction on Greek soil and exercise a direct role as head of the Latin clergy in what remained of Latin Greece. A large hoard of late medieval jewellery dating from Venetian times was found in Chalcis Castle in the nineteenth century and is now in the British Museum. Negroponte played a significant role in the history of Frankish Greece, and was attacked by the Principality of Achaea in the War of the Euboeote Succession (1257/8), the Catalan Company in 1317, the Turks in 1350/1, until it was finally captured by the Ottoman Empire after a long siege in 1470. That siege is the subject of the Rossini opera Maometto II. 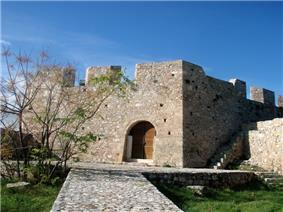 The Ottomans made it the seat of the Admiral of the Archipelago (the Aegean Islands). In 1688, it was successfully held by the Ottomans against a strong Venetian attack. 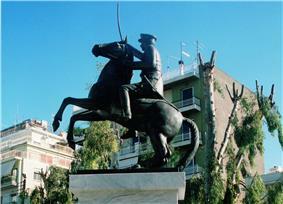 The modern town received an impetus in its export trade from the establishment of railway connection with Athens and Piraeus in 1904. In the early 20th century it was composed of two parts—the old walled town at the bridge over the Euripus, where a number of Turkish families continued to live until the late 19th century, and a sizeable Jewish community lived until World War II, and the more modern suburb that lies outside it, chiefly occupied by Greeks. The old town, called the Castro, was surrounded by a full circuit of defense walls until they were completely razed for urban development around the start of the 20th century. The most interesting building in Chalcis is the church of Saint Paraskevi (the patron saint of the island), which was the church of the Dominican Priory of Negroponte, one of the first two houses authorized for the Province of Greece in 1249. Started about 1250, this is among the oldest examples of early Dominican architecture surviving, and is one of the only early Dominican churches to retain its original form until the present. The central arch over the iconostasis and the ceiling and walls of the south chapel are the best examples of Italian Gothic stone-carving in Greece. Images of the Dominican saints, Dominic and Peter Martyr, stand at the base of the central arch. The north chapel holds the tomb of the founder of the senatorial Lippamano family of Venice. Some of the column capitals are Byzantine. 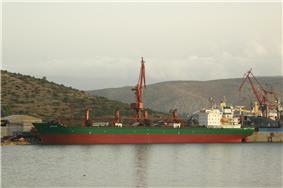 M/V Arktos at Chalkis Shipyards. 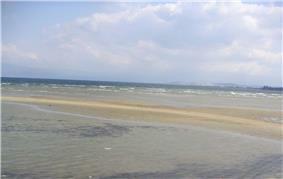 The Euripus Strait which separates the city and the island from the mainland was bridged in 411 BC with a wooden bridge. 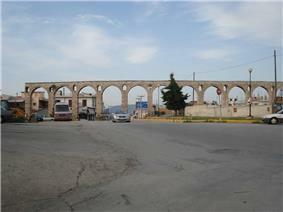 In the time of Justinian the fixed bridge was replaced with a movable structure. The Turks replaced this once again with a fixed bridge. In 1856, a wooden swing bridge was built; in 1896, an iron swing bridge, and in 1962, the existing "sliding bridge"; the construction works of the 19th century destroyed the most part of the medieval castle built across the bridge. 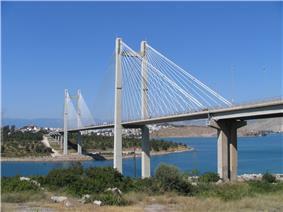 The cable stay suspension bridge which joins Chalcis to the mainland to the south was opened in 1993. A special tidal phenomenon takes place in the strait, as strong tidal currents reverse direction once every six hours, creating strong currents and maelstroms. This creates an amazing sight for visitors from all over the world. GR-1/E75 is south and west about 10 km (6 mi) from Chalcis in Boeotia. In 2003, a bypass of Chalcis was opened from the southern part of the bridge to connect with GR-77, also with access to GR-44. 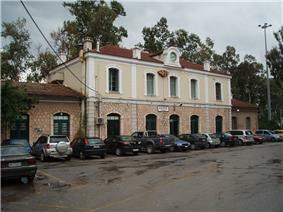 Chalcis is also the northern terminal of line 1 of Athens suburban railway (Proastiakos). 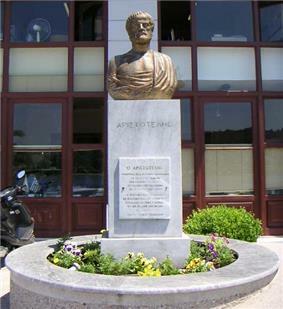 Bust of philosopher Aristotle, from Chalcidice, apoikia of Chalkis. Giovanni Maria Angiolello from Vicenza, Italy, 15th century. Chalcis also has a water polo team named NC Chalkida, a football team named Chalkida F.C., as well as a junior football team named Evoikos Chalkida. The Chalkida football team merged with Lilas Vasilikou for a period of two years (2004–2006). The team was finally dissolved because of financial difficulties. Although there was a team created with the same name (AOX) it does not represent the glorious team of the past. Chalcis also has a basketball team (AGEX), which previously played in the Greek A2 Basketball League. For a while, Chalkida hosts the basketball team Ikaros Chalkidas that played in the top Greek Basket League. ^ De Facto Population of Greece Population and Housing Census of March 18th, 2001 (PDF 39 MB). 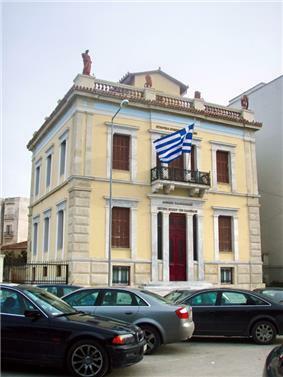 National Statistical Service of Greece. 2003. ^ Richmond, Henry J. (1905), The Pronunciation of Greek and Latin Proper Names in English, Ann Arbor: George Wahr, p. 32 . ^ Simon C. Bakhuizen, R. Kreulen, Chalcis-in-Euboea: Iron and Chalcidians Abroad, Brill Archive, 1976, p. 58. ^ Oxford English Dictionary, 1st ed. "3adj. & n.Chalcidian, ". Oxford University Press (Oxford), 1933. ^ Loenertz, R.-J. (1966). "Cardinale Morosini et Paul Paléologue Tagaris, patriarches, et Antoine Ballester, vicaire du Papae, dans le patriarcat de Constantinople (1332-34 et 1380-87)". Revue des études byzantines (in French) 24: 224–256. ^ Andrews, Castles of the Morea. p. 191. ^ Spyros Kokkinis, "Ἱστορικὰ μνημεῖα καὶ λαϊκὴ ἀρχιτεκτονικὴ στὴν Χαλκίδα". Ἀρχεῖον Εὐβοϊκῶν Μελετῶν, 15 (1969), 149—248. ^ Nikolaus Delinikolaos and Vasiliki Vemi, "Αγία Παρασκευή Χαλκίδας. Ένα βενετικό πρόγραμμα ανοικοδόμησης του 13ο αιώνα." in Chryssa Maltezou and Christina E. Papakosta eds., Venezia-Eubea, Da Egripos a Negroponte, 2006, 229-266, at pages 248—49. ^ Pierre MacKay, "St. Mary of the Dominicans: The Monastery of the Fratres Praedicatores in Negropont." in Chryssa Maltezou and Papakosta eds., Venezia-Eubea, 125-156. ^ Ramsay Traquair, "Frankish Architecture in Greece," Journal of the Royal Institute of British Architects Third Series, 31, (1923—24) 42—48, fig. 13 ("Italian Gothic", p. 47). ^ The two first Dominican saints can just be made out at the base of the arch in a photograph in Beata Panagopoulos, Cistercian and Mendicant Monasteries in Mediaeval Greece. Chicago, 1979, plate 105, p. 133, but not with any detail. ^ Eginitis, D. (1929). "The problem of the tide of Euripus". Astronomische Nachrichten 236 (19–20): 321–328. 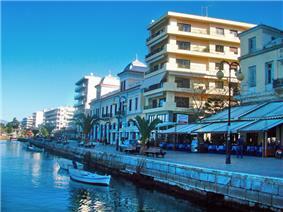 ^ "Evia Island". Chalkis. Evia.gr. Retrieved 29 June 2013. ^ "Weather statistics for Chalcis, Central Greece (Greece)". www.yr.no. Retrieved 23 March 2015.